Elsie™ is an uncommon commercial-grade lumped-element ("L-C") electrical filter design and network analysis program, directed toward the engineer, technician or hobbyist involved in that line of work. The free Student Edition of Elsie is quite adequate for student use or for use by small manufacturing operations. But with the key it operates in the more capable Professional Edition. The principal difference between the Student Edition and the Professional Edition of Elsie lies in the Student Editions's limit on the number of network components. In addition, the editing library of manually-entered components is restricted somewhat in the Student Edition to inductors, capacitors, resistors, and series and shunt jX entries. No lines, stubs, transformers or coupled inductors are allowed. The Professional Edition allows those components and others to be manually entered. That "number of network components" is 7 for the Student Edition and 41 for the Professional Edition. For filter design, the order is 7 for the Student Edition and 21 for the Professional Edition excepting Bessel and Gaussian which are limited to 10 (because the normalized values are from a lookup table). 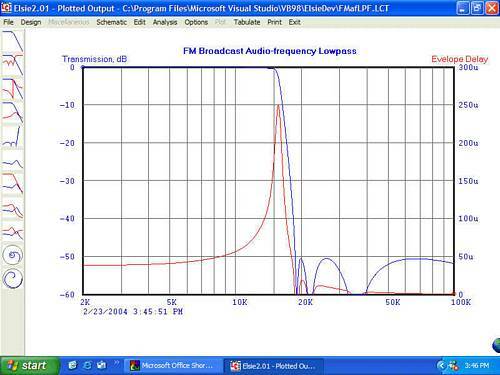 Elsie is 32-bit Windows® electrical filter design software nicely written to help engineers design and analyze lumped-element filters in the audio through microwave range. Thanks to the standard interface, all of the various aspects of program operation are quite easy to use. Most options are selected by clicking on buttons. No scripts. Not a DOS lookalike. Schematics are drawn correctly, not using text characters. This filter design program designs and then analyzes filters with a wide variety of topologies and families and with specified orders, bandwidths, impedances and the like. The usual filter families of Butterworth, Chebyshev, Cauer (including the zig-zag transform), Bessel, Gaussian, Constant-K and M-derived are covered. The quality of the screen graphics is very high (dependent on your monitor), and include transmission (S21), return loss (S11), transmission with its angle, group (envelope) delay, VSWR, input impedance and its angle and more (selected pairs of these items). To maintain this level of quality, the outputs to the printer are not "screen dumps" but instead are from a separate set of dedicated routines which write directly to the printer. The quality of the graphics as delivered by the printer will be limited only by that printer and the number of test frequency steps used (up to 2048 steps). The graphics items automatically adjust themselves to various resolution screens. As an example, the size of the plot on monitors of 800x600, 1024x768 or 1280x1024 is the same in terms of centimeters or inches. Aspect ratio of the screen display can be adjusted so Smith Charts look circular on any monitor width-to-height ratio. Markers can be placed on the plots. 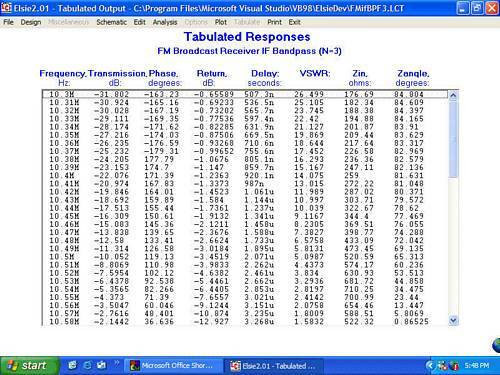 These reveal the data for that plot at the markers' frequencies. Up to eight markers can be defined. The data for each frequency is shown in tabular form beneath the plot. Limits areas can also be placed on the plots. These mark the "out of bounds" area and are useful as a tool to assist in a manual tuning operation. Up to ten limits areas can be placed on each plot. They are used as part of the optimization routine to generate an error value. It has a Monte Carlo routine and an extension of that forms the optimizer. You can tune the width and/or center of a filter Elsie designed. Those items are adjusted using the mouse; the filter is immediately redesigned, reswept and replotted. Unique and fast - milliseconds per step. You can select an item and adjust its value - "tune" it - by clicking on buttons. Because the filter design and analysis routines are very closely coupled, the results are seen immediately on the screen. There is no need to go to another program or routine to see the effects of finite inductor Q, as an example. 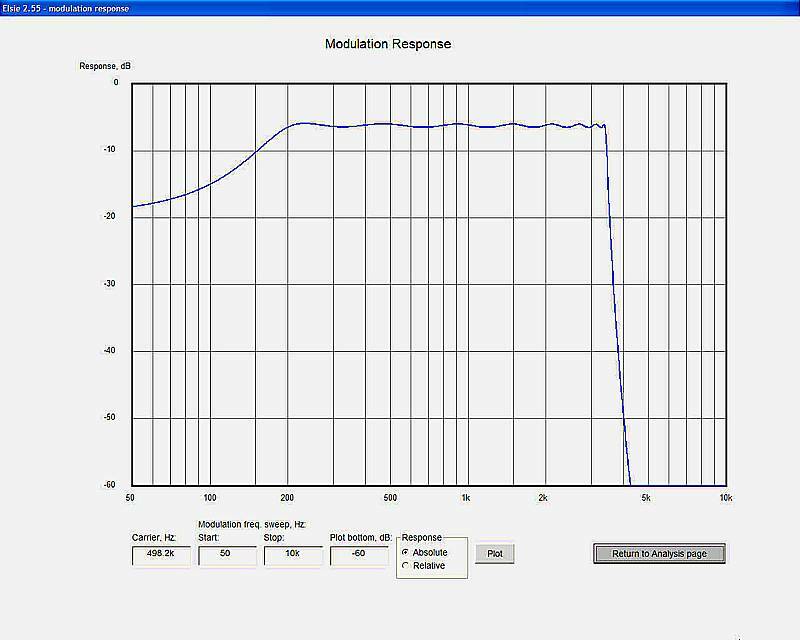 The tuning modes in conjunction with the optimizer and limits areas allow you to easily see the effect of adjusting a particular part, or to achieve a response shape meeting some unusual requirement. It stores up to ten plots ("overlays") which can be recalled for comparison. Develop a filter, store the data plots for it, make changes to the filter, and then recall any of those overlays. The data is stored on the hard drive and so is available in future sessions, not just while the program is currently running. They'll be overlaid on top of your current graph for quick visual comparison of designs. This facilitates a very fast visual comparison of different families or orders or other network differences. See the "overlay example" graphic below. When a plot is showing, put the cursor on the plot and press the mouse button to see a line of data at the bottom of the screen showing all of the information for the frequency corresponding to the cursor position. See the corresponding data (all of the data) at the bottom of the screen. 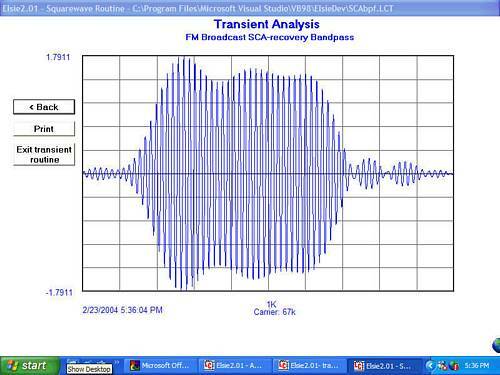 Move the cursor and the data line reveals the data for that new frequency. Of course that data is also available in tabular form. It has a very flexible routine for installing the nearest 5% values (all parts, inductors only, capacitors only or one of those while maintaining resonant frequencies of L-C pairs). 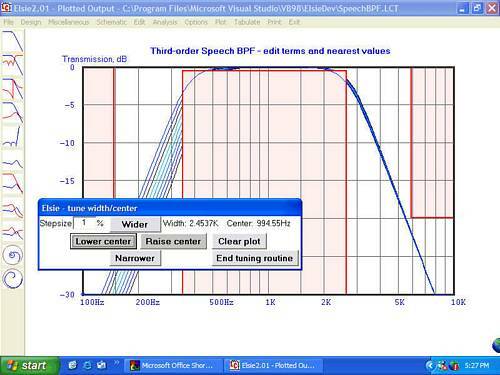 This latter feature is especially helpful in the design of Cauer filters. It has a library of components (including transmission lines and stubs, transformers, arbitrarily-coupled inductors, and resistors, as well as unique-to-Elsie parts) which can be added onto or inserted into the schematic manually so you can see the result. 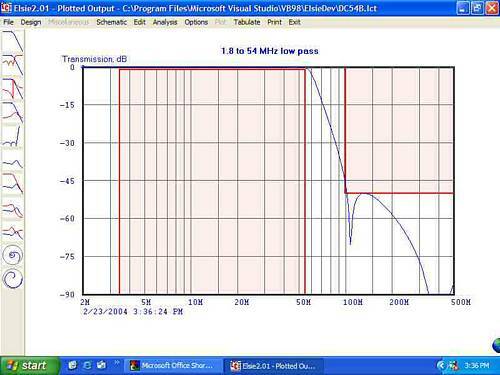 For example you can add a piece of coax (specify the impedance and length) to the filter and see what changes result. It allows manual entry of any of the library components or changing them once the filter has been entered. Any of those library components can be installed or their values changed. It allows changing some elements to their distributed (coax) equivalents. Easily change a series inductor to a high-impedance line, for example. Or a shunt capacitor to a low-impedance line. 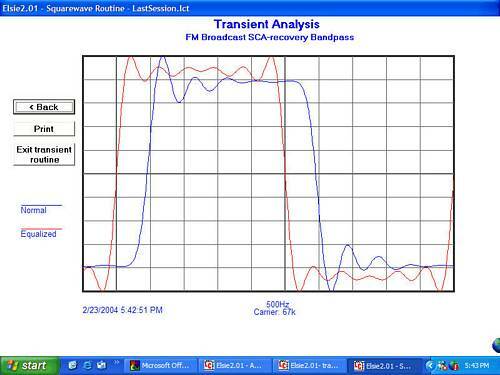 You can save all of the data presented as a set of files in two-column (frequency, data) for analysis by another program, for example an FFT routine to see a waveform spectrum. There are neither headers nor footers on those files to confuse the issue. Up to nine such sets of files may be saved; these are the same files used to present the overlays. It writes schematic files for LTspice (from Linear Technology Corp.). The normalized-values for a design are available, along with the option to send them to the printer; see graphic below. This program is designed to approach the capabilities of the complex do-everything programs while retaining the ease of use of lesser programs. The program requires a monitor with a resolution of 800x600 or better. Graphics are auto scaled to accommodate higher monitor resolutions (which are recommended). Want to have a third-party monitor this page for any changes? Easy! Go to this site and have them monitor this page for you. This allows you to be assured of knowing about the latest revisions to the program. Updated to 2.25 - Add option to show "magnified" plot on Transmission graph to reveal detail in low-loss region. Updated to 2.24 - Changes to design page to prevent design of families requiring passband ripple when no such entry is present. Updated to 2.23 - Add M-derived family with up to five specifiable zeros; update Help system. Updated to 2.22 - Eliminate ProLite option; miscellaneous upgrades. 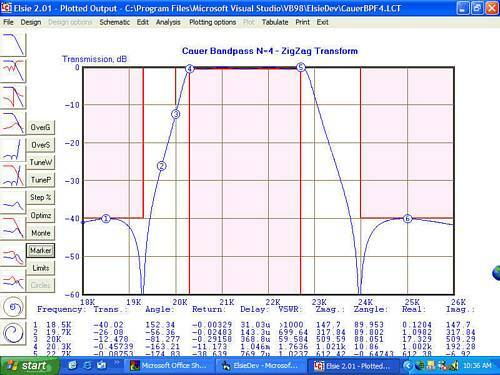 Updated to 2.21 - Rewrite of bandpass impedance-matching routine. Updated to 2.20 - Add nominal-value plot(s) at end of Monte Carlo routine. Also allow overlays to be placed on top of Monte Carlo display. Updated to 2.19 - Remove revision number checking, fix tuning mode error. Updated to 2.18 - Added resistors to those elements used for the Optimization and Monte Carlo routines. Note: Tonne Software has no connection with Linear Technology Corp. Updated to 2.11 - Rewrite of Monte Carlo and Optimization routines; notice design changes and suggest saving prior to retrieving a new design; upgrade Help system. Updated to 2.10 - Rewrite overlay plotting including simple deletion of overlay files; print all overlay files on hardcopy outputs (to duplicate screen); upgrade Help system. 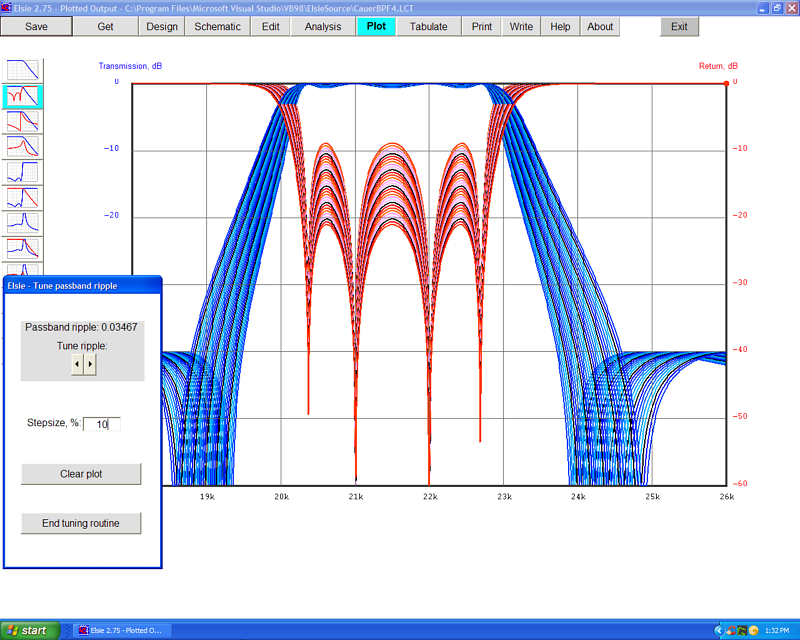 Updated to 2.09 - Correct error in coupled-inductor component in the optimization routine; minor interface improvements. Updated to 2.08 - Near-total rewrite of Plot page menu and Help graphics. Updated to 2.07 - Printing problem resolved; nearly complete rewrite of menu and help system. Updated to 2.06 - Cosmetic only; most text size as well as graphics now independent of screen resolution. Updated to 2.05 - Add another error-trap to Cauer design. Updated to 2.04 - Add error-trap to Cauer design. Updated to 2.03 - All outputs to printer are now routed via Printer Selection windows.